Are you looking for a better Santa experience? Why wait in long lines only to be pushed through before you can even tell Santa what you want for Christmas? This year, make your appointment to spend 10 minutes with Santa. While you are chatting, I will take candid pictures and a few posed pictures as well. 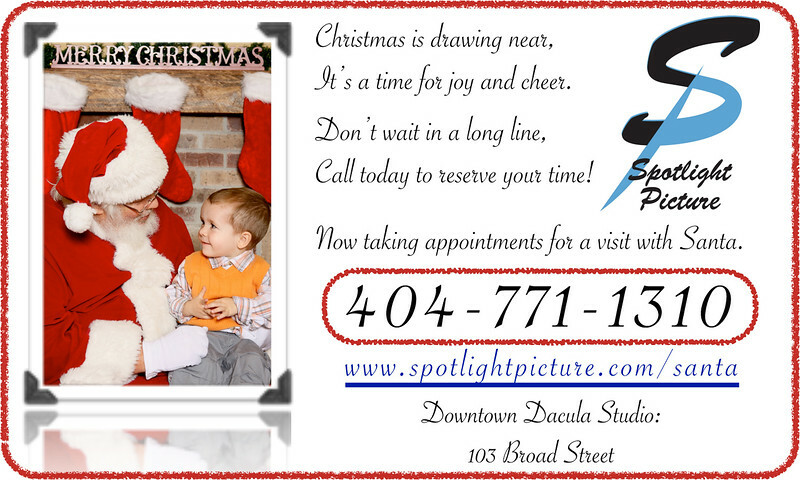 Our studio is decorated for the holiday season for a variety of images with or without Santa. Give us a call today to schedule your appointment. Santa will be available on select weekday afternoons as well as a couple of weekends in late November and early December. In addition to the print prices below, we also offer printed Christmas cards for your convenience. Appointments are now available for Friday November 20 between 5:30pm and 7:30pm as well as Saturday November 21 between 3:30pm and 7:30pm.